I went to go see "The X-Files: I Want to Believe" over the weekend and there was a preview for Saw V. At the rate they keep pumping these flicks out, I just couldn't resist predicting the inevitable "In Space!" installment. Enjoy. "First he chained Westley up in a dank bathroom. Then he locked a bunch of people in a house. Then he died. Then he had an apprentice. Then she died. Then the movies just wouldn't stop. Now years later, Jigsaw's latest game is beginning to unfold. Dr. James Armstrong aboard the International Space Station finds himself an unwilling participant in a dangerous game of cat and mouse. Losing isn't an option for this headstrong, living large doctor. And he better not lose because the life of his wife also hangs in the balance. And his daughter. And his first cousin, Sam. And his parakeet, Sweety. And that other guy introduced in the third act. The action and chills will come so fast and furious you won't even have time to wonder how a dead killer from ten years ago was able to set up traps on a space station that isn't even done being built yet! Marvel at the intricacy of the latest ridiculous methods of torture and death! Be numb at the sheer amounts of blood and gore! 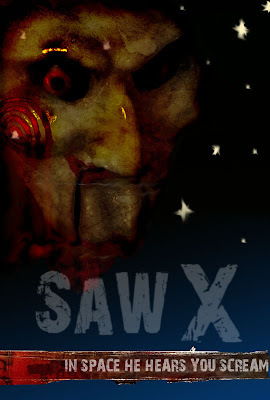 Just be sure to be in theaters this October for Saw X. Remember, in space only HE can hear you scream... FOR MERCY." Like it? Leave a comment. You do realize that this is RIPE for an animated short, right? And yeah, I'd love to see some animated shorts on stuff like this. I'd do it myself but I don't know the first thing about it. That's cool but I just can't wait until Saw the musical comes out and than saw on stage.